If you’re expecting occasional overnight guest, this Synergy Sleeper Ottoman could be a great choice. Covered entirely with rich espresso leather, this piece is a great way to add the coveted look and style of leather to any room. Even if the chair or piece of furniture it is placed beside isn’t matching leather, the natural, neutral tone of this luxurious ottoman will allow it to perfectly mesh into its surroundings. This “transformer” with the locking swivel casters, you can easily move it around in you home. Synergy Sleeper Ottoman price $259.99, Costco Item #143190. 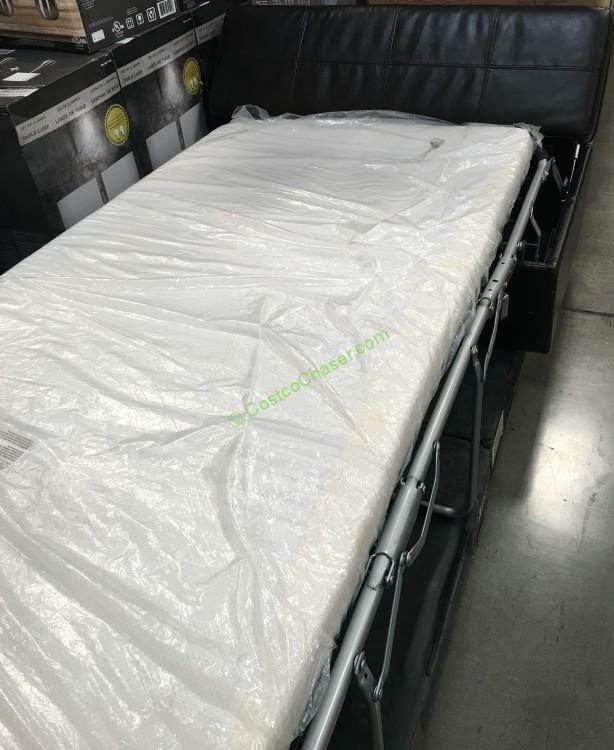 It is very similar to the Synergy Malibu Ottoman with Twin Sleeper, Costco item #727290, previously carried by Costco. When opening and closing, please pay attention to the order of the steps listed on the mattress mechanism. Damage to the mechanism may occur if done in the wrong sequence. Wipe with a clean dry cloth to remove dust and dirt. Use a mild leather cleaner as needed. Leather conditioner may be applied but should be tested in a small inconspicuous area for color changes. This is a warehouse only item. Inventory and pricing may vary at your warehouse location and are subject to change. Synergy Home Furnishings based in Ripley, Mississippi, is a home furnishings manufacturer established in 2006. With a decade of dedication to upholstery manufacturing, sourcing and design services, Synergy's products have been widely recognized by many retailers. Synergye customer servie can be reached at 800-421-9221 between 6:30 am - 3:30 pm CST. Where can I puechSes the mattress only for the ottoman sleeper?